LA JOLLA, CA—Innate lymphoid cells (ILCs) are a type of white blood cell. Rather than recirculating constantly through the body, like most white blood cells, they often instead reside in barrier tissues such as skin, lungs, or the gastro-intestinal tract. Born as precursors in bone marrow, ILCs mature and then travel to peripheral sites to form a first line of defense against invaders. Problems emerge when too many ILCs accumulate or become misdirected against the host, as occurs in conditions such as asthma. 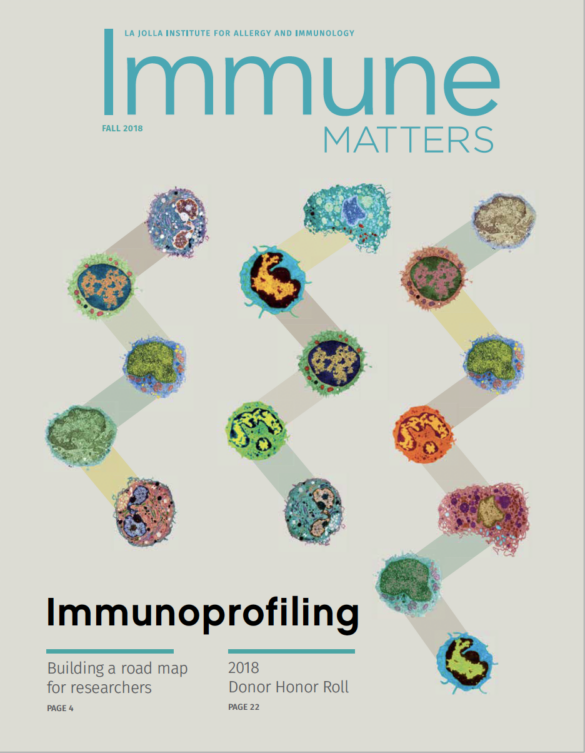 A new paper published in the February 2018 issue of Immunity by La Jolla Institute for Immunology (LJI) researcher Yun-Cai Liu, Ph.D., reports mechanisms used by a subgroup of ILCs, known as ILC2 cells, to undergo maturation required for them to mount an effective immune response. Using a mouse model of respiratory inflammation, the team found that genetically eliminating one of those factors derailed ILC2 cell metabolism in a way that blocked their development and compromised immune activity. These discoveries suggest a novel approach to treat inflammatory disease caused by overactive ILC2s. The Liu lab has pioneered analysis of proteins called ubiquitin ligases, which tag other proteins with a small ubiquitin molecule, often as a way to trigger their normal degradation. In 2015, his group reported that a ubiquitin ligase called VHL is essential to regulate activity of T-cells called “Tregs”. The new study extends these discoveries to a different type of immune cell. Experimentally, the group genetically deleted the VHL gene in mice, but only in ILC2 cells. Interestingly, the number of immature ILC2s in bone marrow was comparable in normal and gene-deleted mice. But when the group checked for arrival of ILC2 cells at peripheral organs—a journey made mainly by mature ILC2s—they observed far fewer ILC2 cells in lung and intestine of mutant compared to normal mice, meaning that precursors likely require intact VHL for maturation. Then, to mimic an asthmatic state, the group exposed both VHL-mutant and normal control mice to a nasal irritant, the papaya protein papain, to stimulate airway inflammation. Mice with intact VHL showed respiratory inflammation and excess airway mucus, as expected, while VHL-mutant mice showed decreased inflammatory activity. The paper also reports why. One VHL target is a protein called Hypoxia-Inducible Factor-1 (HIF-1), which implements cell survival strategies in low oxygen conditions. HIF-1 does this in part by changing how cells metabolize glucose to a relatively inefficient but serviceable pathway called glycolysis. The study indicates that in the absence of VHL ubiquitination activity, HIF-1 levels soar, causing ILC2s to perceive oxygen levels as low when they really aren’t. As a consequence, cells initiate the glycolytic program, a metabolic misreading that blocks their maturation and accounts for their absence in lung and gut. The VHL-HIF-1 axis is of great interest overall, as cancer cells often reside in a low-oxygen milieu and upregulate HIF to establish a glycolytic state favoring tumor cell survival. In fact, Liu notes that pharmaceutical companies are trying to develop small molecule HIF inhibitors as cancer treatment. The new work suggests that manipulation of this pathway could be useful to treat allergic diseases. This work was primarily supported by the National Science foundation of China and National Institutes of Health, USA.